Compare Cell Viability Counters: Which Cellometer is Right for Me? Nexcelom offers a range of Cellometer systems developed and optimized for specific applications and cell types. From basic cell counting to more sophisticated 2-color primary cell analysis to fluorescent cell-based assays, there is a Cellometer system to meet your needs. The Cellometer Auto 2000 Cell Viability Counter is designed for simple, accurate analysis of nucleated cells (including PBMCs, splenocytes, stem cells) in peripheral blood, cord blood, bone marrow, and other heterogeneous samples. The Cellometer Vision CBA Image Cytometry System offers analysis of a growing range of cell-based assays, including assays for apoptosis, autophagy, cell cycle, proliferation, GFP, RFP, YFP, cell surface markers, and many others with flow-like data reporting. Specialty Cellometer instruments are available for specific cell types (platelets, algae, yeast, hepatocytes, adipocytes). The highlighted boxes in the table below indicate the “minimum” recommended instrument for concentration & viability determination of some common cell types. *A messy sample is a heterogeneous sample containing unwanted cell types, such as red blood cells, in addition to the cells of interest. All Cellometer systems offer proprietary Cellometer software for accurate analysis of clumpy and irregular-shaped cells, calculation of mean cell diameter / cell size distribution, and raw and counted images for visualization of cells and counting results. Based on answers to these questions, it is possible to determine the Cellometer system that is currently needed in the laboratory as well as the Cellometer system that will best meet the future needs of the group. 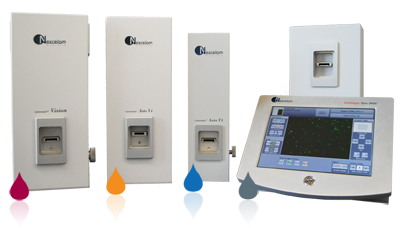 Each Cellometer system combines a unique set of hardware and software features for analysis of particular sample types and / or fluorescent assays. The table below compares various features of the Cellometer systems. Because Cellometer systems utilize image cytometry, a non-fluidic technology, there is no washing or routine maintenance. Individuals can save unique protocols, making Cellometer systems easy to share between users. Saved imaging parameters and assay protocols and automatic calculation of results reduce user errors and variability between operators. Auto-save features ensure that all data is accurately captured. Images and data tables are easily archived and exported for reports and publications. Experienced Nexcelom Applications Specialists are available to assist with selection of a Cellometer system to best meet your application and budget requirements. Contact Nexcelom at 978-327-5340 or info@nexcelom.com today to speak with an Applications Specialist or schedule a free on-site demonstration or technical seminar.